Passive depletion of internal Ca2+ stores in airway smooth muscle (ASM) activates nonselective cation channels (NSCCs) that mediate capacitative Ca2+ entry. However, the single channel properties of these cation channels have yet to be resolved and their regulation by cytosolic Ca2+ levels ([Ca2+]i) still remains unclear. NSCC currents and changes in [Ca2+]i during passive depletion of internal Ca2+ stores were monitored in isolated bovine tracheal myocytes. Loading cells with 1,2-bis(o-aminophenoxy)ethane-N,N,N′,N′-tetracetic acid acetyl methyl ester (BAPTA-AM) to reduce [Ca2+]i and thereby deplete the store augmented a basal Gd3+- and La3+-sensitive, Ca2+-permeable NSCC current. This current mimics that which is evoked by store depletion using the sarcoplasmic reticulum Ca2+ pump inhibitor cyclopiazonic acid (which concurrently and transiently elevates [Ca2+]i). Both interventions activated an ∼25-pS NSCC with properties identical to both spontaneous (basal) and BAPTA-AM-evoked single channel currents. In summary, the present study provides novel evidence that a lanthanide-sensitive, 25-pS nonselective cation channel underlies both basal and store depletion-evoked membrane currents in airway smooth muscle and that this conductance likely contributes to the regulation of resting [Ca2+]i and capacitative Ca2+ entry. Agonist-mediated bronchoconstriction involves release of Ca2+ from the sarcoplasmic reticulum (SR) 1–4. The mechanisms responsible for store-refilling remain unclear but seem to include voltage-gated Ca2+ channels 5, nonselective cation channels (NSCCs) 1, 6, 7 and/or reverse-mode Na+/Ca2+ exchange 8, 9. NSCCs formed by proteins of the transient receptor potential (TRP) family have received a great deal of attention, particularly those of the “canonical” or “classical” subtype (TRPC) 10–12. In airway smooth muscle (ASM), evidence of a functional link between TRPC expression and enhanced Ca2+-influx (i.e. capacitative Ca2+ entry (CCE)) remains sparse. Recently, White et al. 10 demonstrated that disruption of endogenous TRPC3 expression in human ASM reduced both resting cytosolic Ca2+ concentration ([Ca2+]i) and CCE; indirect pharmacological data suggested involvement of a NSCC but membrane currents were not measured directly. Indeed, only a few studies have directly examined store depletion-evoked membrane currents in ASM 1, 7, 13. Hence, it is not surprising that their single channel properties have yet to be resolved. In addition, many previous studies of CCE were performed in the presence of agents which release stored Ca2+ (e.g. inositol triphosphate, caffeine) and/or which inhibit Ca2+ reuptake by the SR Ca2+ ATPase (SERCA; e.g. cyclopiazonic acid (CPA), thapsigargin) 7, 14–17. However, these approaches elevate [Ca2+]i4, 14, which calls into question whether these currents are store depletion-activated or merely Ca2+ dependent since ASM is known to express NSCCs that are facilitated by elevated [Ca2+]i 2, 6, 18; in fact, the time course of activation of whole-cell NSCC currents by CPA in isolated bovine tracheal smooth muscle (TSM) cells paralleled the transient increase in [Ca2+]i 7. In order to better understand the relationship between store depletion, activation of NSCCs and regulation of [Ca2+]iin ASM, activation of NSCC current during SR-depletion by loading the cells with the Ca2+ chelator 1,2-bis(o-aminophenoxy)ethane-N,N,N′,N′-tetracetic acid acetyl methyl ester (BAPTA-AM) was compared with inhibiting SERCA with CPA. The single channel properties of this conductance were also probed, as well as the contribution of this and other Ca2+-permeable channels in mediating Ca2+ entry upon SR Ca2+ depletion. Here, the present authors report that depletion of SR Ca2+ stores in the presence or absence of cytosolic Ca2+ transients activates an ∼25-pS NSCC that contributes to resting [Ca2+]i, CCE and likely functions to refill internal Ca2+ stores in ASM. All experimental procedures were approved by the McMaster University Animal Care Committee (McMaster University, Hamilton, ON, Canada) and conform to the guidelines set out by the Canadian Council on Animal Care (Ottawa, ON, Canada). Trachea from commercial cattle (136–454 kg) were obtained at a local abattoir and transported in ice-cold Krebs’ solution containing 116 mM NaCl, 4.6 mM KCl, 2.5 mM CaCl2, 1.3 mM NaH2PO4, 1.2 mM MgSO4, 23 mM NaHCO3, 11 mM dextrose and 0.01 mM indomethacin, bubbled with 95% O2/5% CO2 in order to maintain a pH of 7.4. ASM was dissected free of epithelium and connective tissue and maintained in Krebs solution at 4°C for up to 48 h.
Bovine TSM strips were gently agitated for 20 mins in modified Hank’s balanced salt solution (with NaHCO3, without CaCl2 and MgSO4) containing 2 mg·mL−1collagenase (Sigma blend type-F; Sigma-Aldrich, Oakville, ON, Canada) and 250 μg·mL−1 elastase (type-IV) at room temperature (21–23°C), then for an additional 20–40 mins at 37°C. Cells were dispersed by gentle trituration with a wide-bore pipette, centrifuged and resuspended in standard Ringer’s solution containing 130 mM NaCl, 5 mM KCl, 1 mM CaCl2, 1 mM MgCl2, 20 mM HEPES, 10 mM dextrose and 0.1 mM niflumic acid (omitted for Ca2+ imaging) and adjusted to pH 7.4 with NaOH. Single cells were allowed to adhere to the bottom of a recording chamber (1.5-mL volume) and then superfused with standard Ringer’s solution at room temperature (21–23°C). Electrophysiological responses were tested in cells that were phase-dense and appeared relaxed. Average cell capacitance was 59±5 pF (n = 13). Whole-cell currents were studied using the nystatin perforated patch configuration of the standard patch-clamp technique. Pipettes with tip resistances of 3–5 MΩ were fashioned from borosilicate glass. Tip potentials were nulled and electrophysiological recordings commenced, once series resistance dropped below 30 MΩ; 70–80% compensation was routinely employed. A holding potential of 0 mV was used to inactivate voltage-gated Ca2+ channels. Whole-cell currents were low-pass filtered at 1 kHz, sampled and digitised at 2.5 kHz (DigiData 1200 A/D converter; Axon Instruments, Foster City, CA, USA). Liquid junction potentials between the electrode and bathing solutions were 3.5±0.3 (n = 6) and 11±0.3 mV (n = 4) for standard Ringer’s and Na+-free Ringer’s solution, respectively; reversal potentials (Er) shown in the figures are not corrected whereas elsewhere they are corrected as previously described 7.
where Vcell is the membrane potential of the cell and Vpipette is the potential imposed by the recording pipette. Assuming Vcell has been set to 0 mV by the external KCl solution, Vm is the negative of Vpipette. Inward channel currents are shown as downward deflections while outward currents are shown as upward deflections. Single cells were incubated with fluo-4 AM (2 μM; containing 0.1% pluronic F-127) for 30 min at 37°C, then placed in a Plexiglas® recording chamber and superfused with Ringer’s solution for 30 mins to allow for dye de-esterification. Confocal microscopy was performed at room temperature (21–23°C) as previously described 7. Video images (600×400 pixels; Video Savant 4.0; IO Industries, London, ON, Canada) were generated at 1 frame·s−1 for caffeine responses and 0.1 frame·s−1 for all other responses. Average fluorescence intensities from regions of interest (30×30 pixels) defined in central non-nuclear regions of cells were calculated for each frame and plotted against time. Relative changes in [Ca2+]i were expressed in terms of a change in fluorescence (ΔF) over the initial/baseline fluorescence (F0) observed in the presence of 1.8 mM extracellular Ca2+. Caffeine was applied directly to cells via pipette driven by a pressure ejection system (PicospritzerTM II; General Valve, Fairfield, NJ, USA). All drugs and reagents were obtained from Sigma-Aldrich (Oakville, ON, Canada). Ca2+-free Ringer’s contained 130 mM NaCl, 5 mM KCl, 1 mM MgCl2, 20 mM HEPES, 10 mM dextrose, 0.01 mM EGTA and 0.1 mM niflumic acid (omitted for Ca2+-imaging), adjusted to pH 7.4 with NaOH. Na+-free Ringer’s solution consisted of 140 mM N-methyl-d-glucamine (NMDG), 5 mM KCl, 1 mM CaCl2, 1 mM MgCl2, 10 mM HEPES (adjusted to pH 7.4 with NaOH), 10 mM dextrose and 0.1 mM niflumic acid, adjusted to pH 7.4 with HCl. High molar KCl Ringer’s solution contained 126 mM KCl, 1.5 mM CaCl2, 1 mM MgCl2, 10 mM HEPES, 10 mM dextrose and 0.1 mM niflumic acid adjusted to pH 7.4 with NaOH. The intracellular electrode solution for measuring whole-cell currents contained 130 mM CsCl, 5 mM MgCl2, 1 mM CaCl2, 10 mM HEPES and 5 mM EGTA, adjusted to pH 7.2 with CsOH. These pharmacological and ionic conditions eliminated currents through Ca2+-dependent Cl- and K+ channels. The standard electrode solution for on-cell recordings consisted of 126 mM NaCl, 1.5 mM CaCl2, 10 mM HEPES and 10 mM dextrose, adjusted to pH 7.4 with NaOH. For high-Ca2+ electrode solution, NaCl was replaced by 70 mM CaCl2. All on-cell electrode solutions were supplemented with 10 mM tetraethylammonium chloride, 5 mM 4-aminopyridine, 100 μM niflumic acid and 1 μM nifedipine to inhibit K+-, Cl-- and voltage-gated Ca2+ channels. Nystatin for whole cell recordings was prepared in dimethyl sulphoxide (DMSO; 30 mg·mL−1) for storage up to 5 days, and diluted to a final concentration of 300 μg·mL−1 in electrode solution daily. Reagents were dissolved in aqueous media (for Gd3+, La3+, caffeine) or DMSO (for CPA, BAPTA-AM, fluo-4 AM, nifedipine); the final concentration of DMSO in the bath was ≤0.001% in all cases. Whole-cell current records were obtained immediately before and during drug application with each cell acting as its own control. In studies where channel inhibitors were used, data are reported as % inhibition of BAPTA-AM evoked current prior to subtraction of baseline current. Unitary current amplitude histograms for individual patches were constructed from 0.5–2-s sections of raw traces. I–V relationships, from individual patches in which unitary channel current amplitudes were measured at a minimum of three different membrane potentials, were plotted and the unitary conductance and Er for individual patches were then calculated using linear regression (least-squares method). The mean unitary conductance and Er were determined by averaging values from individual patches. All data are reported as means±sem, n values indicate number of animals tested; comparisons were made using a paired or unpaired t-test or one-way ANOVA as appropriate, with p-values <0.05 considered significant. [Ca2+]i responses evoked by a 10-s application of 10 mM caffeine were utilised as an index of SR Ca2+ content. 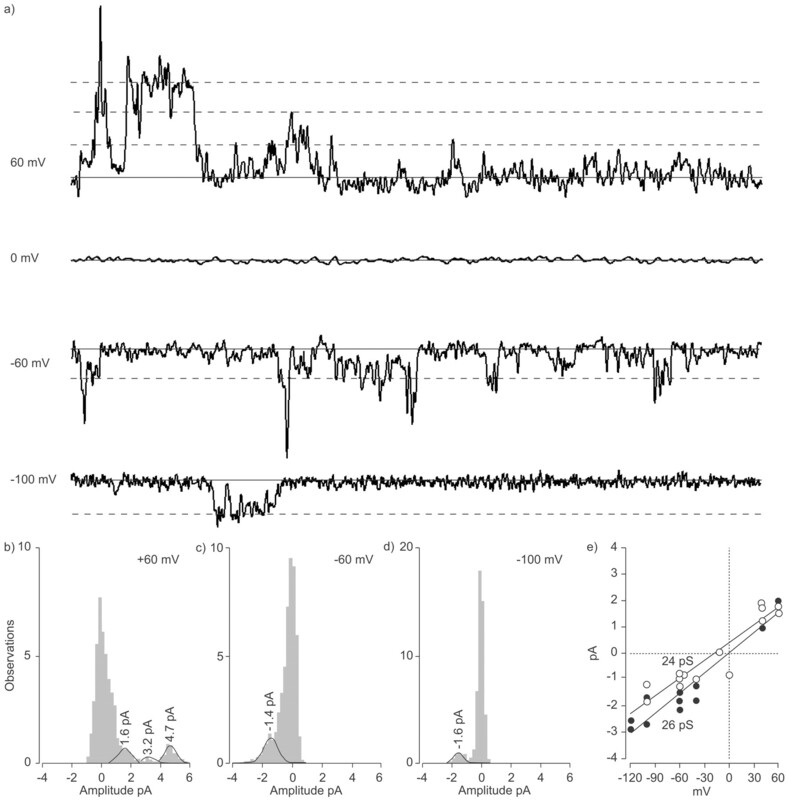 In the presence of 1.8 mM extracellular Ca2+, repetitive caffeine stimulations at 5-min intervals evoked reproducible transient [Ca2+]i elevations (fig. 1a–d⇓). In contrast, bathing cells in Ca2+-free Ringer’s solution for 10 mins, reduced baseline [Ca2+]i (ΔF/F0 = -15±3, n = 35; p<0.001) and decreased the magnitude of caffeine-evoked transients by 52±13% (n = 9; p = 0.027), suggesting that basal Ca2+ entry is necessary for the maintenance of resting [Ca2+]i and SR Ca2+ loading. L-type Ca2+ channels did not mediate this basal Ca2+ entry, since 1 μM nifedipine did not significantly reduce baseline fluorescence (ΔF/F0 = 0.6±0.6, n = 10, data not shown). Effect of store depletion on cytosolic Ca2+ and sarcoplasmic reticulum Ca2+ concentration. a–d) representative fluorimetric traces illustrating effects of removal of extracellular Ca2+ (0 Ca2+; ░), with or without concurrent treatment with: c) 10 μM BAPTA-AM (▒) or d) 10 μM cyclopiazonic acid (CPA) on cytosolic Ca2+ concentration transients evoked by 10 mM caffeine (10 s application; ▓). Caffeine (caff) response mean data expressed both as: e) Change in fluorescence (ΔF)/baseline fluorescence (F0) at initial response to caffeine (Cinitial; ░; # in a–d) and final response (Cfinal; ▒; ¶ in a–d) and f) Cfinal/Cinitial for control cells (n = 10), 0 Ca2+ (n = 9), 0 Ca2+ + BAPTA-AM (n = 10) and 0 Ca2+ + CPA (n = 8). ····: 0. *: p<0.05 versus initial response in same group, paired two-tailed t-test; ##: p<0.05 in a one-way ANOVA versus control. §: p = 0.028; ƒ: p = 0.03. 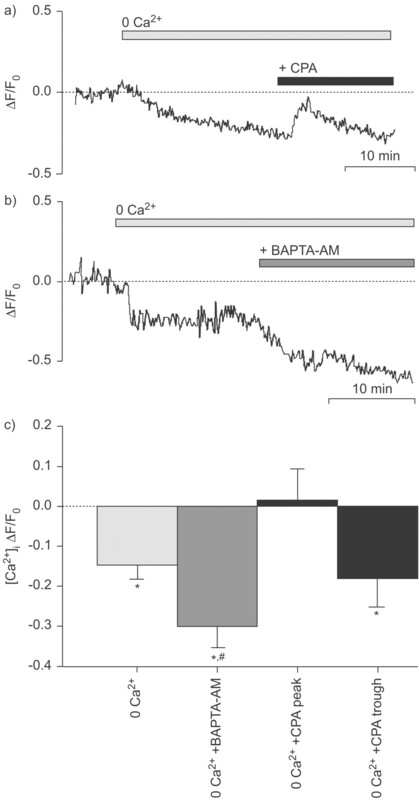 Both CPA and BAPTA-AM (10 μM each) further reduced SR Ca2+ content such that caffeine-evoked [Ca2+]iresponses were reduced to a much greater extent than was seen following removal of extracellular Ca2+ alone (fig. 1a–d⇑). In the absence of extracellular Ca2+, application of CPA evoked a transient rise in fluorescence, followed within 10 mins by a sustained decrease to pre-drug levels (fig. 2⇓); the rise in [Ca2+]i likely reflecting Ca2+ leak from the SR via ryanodine receptors, while the return to baseline involves Ca2+ extrusion via the plasmalemmal Ca2+ pump 4, 5, 14, 19. In contrast, treating cells with BAPTA-AM following removal of external Ca2+ caused a further decline in [Ca2+]i that stabilised within 10–15 mins (fig. 2⇓). Representative traces illustrating changes in cytosolic Ca2+ concentration [Ca2+]i following removal of extracellular Ca2+ (0 Ca2+; ░) followed by inhibition of the sarcoplasmic reticulum Ca2+ ATPase with 10 μM cyclopiazonic acid (CPA) or passive loading with 10 μM BAPTA-AM in bath. c) mean change in [Ca2+]i (n = 12–35). ····: 0. *: p<0.05, change in [Ca2+]i from baseline (F0). #: p<0.05 versus 0 Ca2+, one-way ANOVA. In cells held under voltage-clamp, a small membrane current with mean amplitude of -82±19 pA at -60 mV was observed. 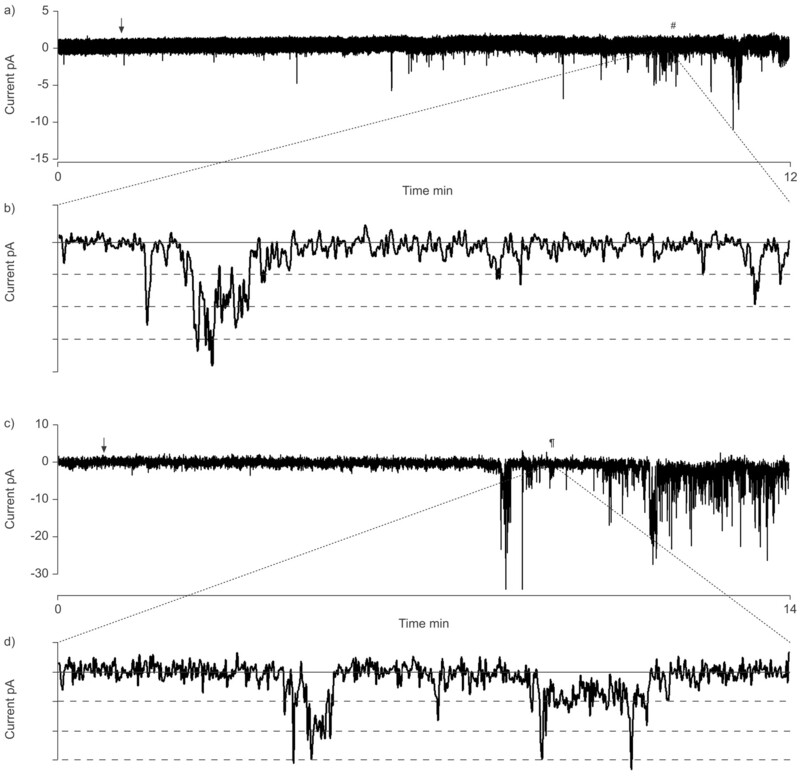 BAPTA-AM markedly increased the amplitude of this current, which was stable for >30 mins (fig. 3⇓). Voltage steps from -80 mV to 60 mV (10 mV increments, 200 ms duration, from a holding potential of 0 mV) elicited currents that showed little time-dependent activation except at very negative potentials and no deactivation over the 200 ms period of the voltage step (fig. 3⇓). The steady-state I–V relationship of both the baseline membrane current and BAPTA-AM-evoked current were linear with Er of 5.4±2.2 and -1.5±1.5 mV respectively (n = 14; fig. 3⇓). Instantaneous I–Vs obtained using ramp voltage commands (-100 to 80 mV, 2-s duration, from a holding potential of 0 mV) were identical (cf. fig. 4d⇓). Store depletion by BAPTA-AM augments a basal nonselective cation channel current. Representative traces of membrane currents evoked by voltage step pulses (200 ms duration, 10 mV increments as shown in d) delivered from a holding potential of 0 mV before (a) and after (b) application of 10 µM BAPTA-AM; the difference in current is also shown (c). e) Mean currents obtained prior to (•) and during application of BAPTA-AM (○; n = 13). f) Difference (□) between before and during application of BAPTA-AM. ····: 0. Effect of removing external Na+ on basal and BAPTA-AM-evoked nonselective cation channel currents. a) time course of BAPTA-AM-evoked (▒) whole-cell current. Mean current (•) observed upon voltage stepping cell to -60 mV from a holding potential of 0 mV (200 ms duration, 10 s intervals). Extracellular Na+ in the bathing medium (flow rate of ∼3 mL·min−1) was replaced with equimolar N-methyl-d-glucamine (NMDG; ░). b) current traces from the cell shown in a at time-points #, ¶, + and §. c) mean basal (□, n = 5) and BAPTA-AM-evoked (▒, n = 4) current at -60 mV before (-) and after (+) replacement of extracellular Na+ (0 Na+). 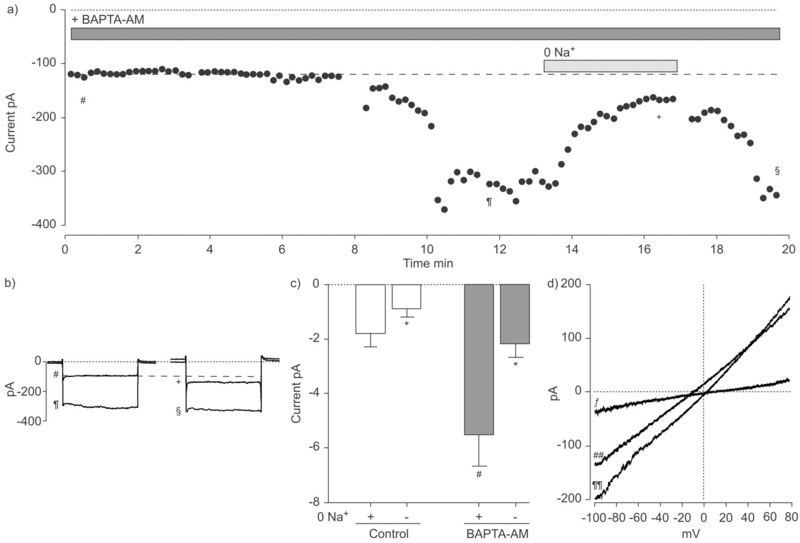 d) basal (ƒ) and BAPTA-AM-evoked membrane currents in the presence of Na+ (¶¶) or following replacement with NMDG (##) obtained from a single cell studied using a voltage ramp from -100 mV to 80 mV over 2 s. ····: 0; ------: basal current. *: p<0.05 reduction upon removal of Na+; #: p<0.05, one-way ANOVA versus control. Replacement of extracellular Na+ with NMDG substantially reduced the inward portion of the BAPTA-AM-dependent current (fig. 4⇑) such that the I–V relationship was best described by a quadratic equation and Er was displaced from -3.8±2.4 mV to -21±1.2 mV (n = 4), representing a shift of -17 mV (95% confidence interval (CI) of -13– -21 mV) as would be expected if Na+ were a major charge carrier for this conductance. Next, the pharmacology of the BAPTA-AM-activated current in these cells was examined by addition of blockers to the bathing medium (results summarised in table 1⇓). La3+, which inhibits CCE in several ASM preparations 10, 16, 20, reduced BAPTA-AM-evoked membrane currents but did not shift Er (fig. 5⇓); this effect was concentration dependent and poorly reversible. Alternatively, 10 µM Gd3+ (which has been widely utilised as an inhibitor of NSCCs and CCE in several smooth muscle cell types 21–23) had little effect on the BAPTA-AM-evoked current, although 100 µM caused a marked and irreversible suppression (fig. 5⇓). Block of BAPTA-AM-evoked whole-cell current by La3+ and Gd3+. Time course of inhibition of BAPTA-AM-evoked (▒) membrane current by a) La3+ or b) Gd3+ in two separate cells. The amplitude of inward membrane currents elicited by voltage stepping cells to -60 mV at 10-s intervals is shown (•). Representative traces of membrane currents studied using voltage ramps in two separate cells. c) La3+ and d) Gd3+ were added to the bathing solution following activation of membrane current by 10 µM BAPTA-AM. Pharmacological profile of BAPTA-AM-evoked membrane current in bovine tracheal smooth muscle cells measured at -60 mV. In order to better understand the nature of the channel responsible for mediating resting and store-depletion evoked whole-cell membrane currents in bovine TSM cells, single channel events recorded from cell-attached patches were examined. Using high-K+ Ringer’s solution to clamp Vm around 0 mV and a pipette solution containing 126 mM NaCl and 1.5 mM Ca2+, discrete single channel openings were recorded at both positive and negative transmembrane potentials (fig. 6a⇓). In eight of the 18 cells examined, these spontaneous events were sufficiently frequent to allow for analysis of unitary current amplitudes; the I–V relationship of the spontaneous single channel currents had a slope-conductance of 26±0.3 pS with Er = -2±3 mV (n = 4; fig. 6e⇓). When studied with a patch pipette containing 70 mM CaCl2 the slope conductance was unchanged (24±2 pS) but the Er was shifted leftward -14 mV (p = 0.024, n = 4; fig. 6e⇓), indicative of a high permeability to Na+. Properties of spontaneous unitary nonselective cation channel events. a) Representative traces of spontaneous single channel currents observed in a cell-attached patch (126 mM NaCl2 electrode) at different potentials. –––: closed channel state; - - -: predicted open states. All-points histograms for the data presented in (a) at b) 60 mV, c) -60 mV and d) -100 mV. e) Mean current–voltage plots for spontaneous unitary channel currents studied with pipettes containing 126 mM NaCl (•; n = 4) or 70 mM CaCl2 (○; n = 4). ····: 0. In membrane patches exhibiting little evidence of spontaneous single channel activity, treatment with 10 µM CPA or 10 µM BAPTA-AM substantially increased the number of single channel events (figs 7 and 8⇓). The I–V relationships for these unitary events were linear in nature, with a slope-conductance of 23±1 and 26±1 pS and Er occurring at -5±3 and -6±1 mV for CPA (n = 7) and BAPTA-AM (n = 3), respectively (126 mM NaCl electrode and 140 mM KCl bathing solution; fig. 8⇓). When studied with a 70 mM CaCl2 pipette solution, the slope conductance and Er of the CPA-evoked single channel current was 20±1 pS and -10±5 mV (n = 3), respectively. The similarities in the properties of the spontaneous, CPA- and BAPTA-AM-evoked single channel currents, as well as the similarity of their I–V relationship with that of the whole cell current, suggests that the same NSCC underlies all three. Properties of cyclopiazonic acid (CPA) and BAPTA-AM-evoked single channel currents. Representative traces of single channel membrane currents induced by bath application (arrow) of 10 µM a) CPA or c) BAPTA-AM at a transmembrane potential of -60 mV. The 500 ms portions (#, ¶) of recordings are expanded in b) and d) for CPA and BAPTA-AM, respectively. –––: closed channel state; - - -: predicted open channel states. Pipettes contained 70 mM CaCl2 (a, b) and 126 mM NaCl (c, d). 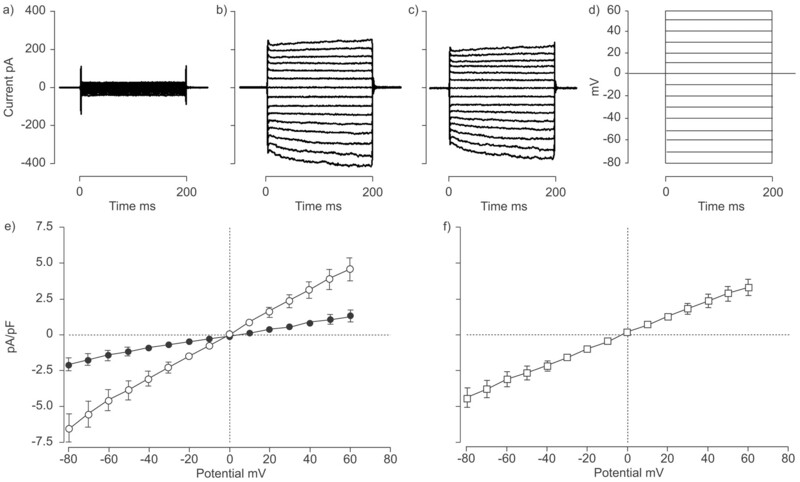 Mean current–voltage plots for a) cyclopiazonic acid (CPA) and b) BAPTA-AM-evoked unitary channel currents measured with pipettes containing 126 mM NaCl (•; n = 7 and n = 4 for CPA and BAPTA-AM, respectively) or 70 mM CaCl2 (○; n = 3). In many smooth muscle cell types, agonists release Ca2+ from an intracellular Ca2+ store 6, 16, 23. Subsequent restoration of [Ca2+]i includes both re-uptake into the store by SERCA as well as extrusion from the cell by the plasmalemmal Ca2+ pump and/or Na+/Ca2+ exchanger. As such, there must be mechanisms in place to compensate for the net loss of cellular Ca2+ in order to avoid complete depletion of the store. In ASM, it appears that CCE, mediated by NSCCs, may be involved 1, 5, 7, 13; however there are many unresolved issues regarding the electrophysiological properties, regulation and physiological roles of these channels. The present study examined the properties of a membrane conductance activated by store depletion through either chelation of intracellular Ca2+ with BAPTA or inhibition of SERCA with CPA. In addition, the relative contribution of this channel in regulating [Ca2+]i and CCE was also examined, with the goal of generating a better understanding of the ionic mechanisms underlying CCE in ASM. Notably, novel data regarding the single channel characteristics of this conductance are presented. Many of the isolated bovine TSM cells displayed NSCC currents at rest (i.e., prior to store depletion); this has been described previously 7. NSCCs in ASM, whether activated by G-protein coupled receptor stimulation 6 or by passive depletion of SR Ca2+ (present study and 7), are highly permeable to Na+, conducting a significant inward Na+ current across a range of physiologically relevant membrane potentials (e.g. -60 to -30 mV). A large portion of the baseline and BAPTA-AM-evoked NSCC currents in the present study were also dependent upon extracellular Na+ (fig. 4⇑). These channels are also known to conduct Ca2+. Although one estimate found this to comprise only 14% of the overall current, it is sufficient to maintain a modest yet sustained elevation of [Ca2+]i 2, 6. Others have demonstrated a constitutively active, nifedipine-insensitive Ca2+ influx pathway in bovine TSM, which is speculated to contribute to a resting [Ca2+]i around 100-150 nM 14, 20. CPA enhances Ca2+ entry in several other ASM preparations presumably through activation of Ca2+-permeable NSCCs 10, 15, 16, 24. Basal NSCC currents have also been described in isolated smooth muscle cells from rabbit portal vein 25, ear artery 26 and coronary artery 22 as well as rat pulmonary artery 27. The signalling pathway underlying activation of the store-operated NSCC currents is unclear. In the present study, G-protein coupled receptor signalling was not necessary for NSCC activation, since treatment with BAPTA-AM or CPA alone was sufficient, although the possibility that this current may be regulated through diacylglycerol–protein kinase C-dependent mechanisms as demonstrated in vascular smooth muscle 28 cannot be ruled out. Also, although Ca2+-dependent facilitation of NSCC currents has been described in equine 2, 6 and porcine 18 TSM, the possibility that this channel was merely regulated by Ca2+ or Ca2+-dependent mechanisms is unlikely, since CPA evokes a transient increase in [Ca2+]i 7 whereas BAPTA-AM suppresses [Ca2+]i. In rabbit portal vein myocytes, spontaneous and store depletion-activated single channel events exhibit identical properties including unitary conductance, Er and mean open times, suggesting that a similar channel underlies both currents 25. To determine if a similar mechanism operates in ASM, on-cell measurements of single channel currents were conducted both prior to and during passive store depletion with either CPA or BAPTA-AM. In all cell-attached patches examined, there was evidence of spontaneous single channel activity (∼44% exhibiting robust activity), which was attributed to a NSCC, given that the conductance was permeable to Na+ and Ca2+ and that membrane currents through Ca2+-regulated Cl- channels, voltage-operated K+ channels, Ca2+-regulated K+ channels and voltage-operated Ca2+ channels were eliminated by experimental design. Application of CPA or BAPTA-AM greatly increased the frequency and number of unitary channel events observed; single channel analysis revealed this to be mediated by a unitary conductance of ∼25 pS. The lanthanides Gd3+ and La3+ inhibit CPA-activated membrane currents and/or CCE in several tissues 16, 21, 27. In the present study, application of 10 and 100 µM La3+ reversibly inhibited the BAPTA-AM-evoked current in a dose-dependent manner. This current was also found to be largely resistant to 10 µM Gd3+, although 100 µM Gd3+ caused a marked reduction of ∼80%. In contrast to La3+, the inhibitory effect required several minutes to develop fully and was irreversible. It has been similarly found that extracellular Gd3+ irreversibly blocks TRP3 currents in Chinese hamster ovary cells with a late onset 29; the authors of that study speculated that the kinetics of inhibition by Gd3+ in intact cells relied upon the uptake and extrusion rate of this cation, since the median effective concentration (EC50) was lower and the rate of inhibition faster when Gd3+ was applied to the cytosolic face of the channel. While others have shown that a 25 pS NSCC with similar properties (i.e., unitary conductance and sensitivity to 1 mM La3+, Gd3+ and 100 µM SKF 96365) is activated by leukotrienes in isolated human BSM, its role in mediating CCE was not specifically examined 3. As such, the current finding that an ∼25 pS channel underlies CPA- and BAPTA-AM-evoked NSCC currents in bovine TSMs is novel. The magnitude of the conductance described herein is 10-fold greater than that reported for store depletion-activated NSCCs in vascular smooth muscle cells 25, 30, 31; the possibility that small conductance NSCCs were hidden within the noise inherent in the recordings cannot be ruled out. Involvement of this NSCC explains why the Ca2+ entry induced by CPA was resistant to nifedipine (fig. 6⇑). Bazan-Perkins et al. 20 found that the rate of Ca2+ entry in bovine TSM cells with depleted SR Ca2+ stores was resistant to D600. Likewise, in guinea pig TSM, depletion of SR Ca2+ with the SERCA inhibitor thapsigargin induced a rise in [Ca2+]i and a contraction that was dependent upon extracellular Ca2+, was inhibited by Ni2+ and SKF 96365 but not nifedipine 15, and similar results have been observed in rat basolateral membrnae upon depletion of acetylcholine-sensitive stores 1. In summary, the present authors conclude that loading of bovine tracheal smooth muscle cells with BAPTA-AM (in order to reduce cytosolic Ca2+ concentration and thereby deplete the store) augments a basal, Ca2+-permeable nonselective cation conductance that is both Gd3+- and La3+-sensitive. In addition, the present findings indicate that an ∼25 pS nonselective cation channel underlies both basal, cyclopiazonic acid- and BAPTA-AM-evoked membrane currents in this tissue. Furthermore, the data suggest that nonselective cation channels contribute to the regulation of cytosolic Ca2+ concentration and sarcoplasmic reticulum refilling and are likely to be responsible for the capacitative Ca2+ entry observed in airway smooth muscle. These studies were supported by operating grants and a Career Award (L.J. Janssen) from the Canadian Institutes of Health Research (MOP 15561) and the Ontario Thoracic Society. Sweeney M, McDaniel SS, Platoshyn O, et al. Role of capacitative Ca2+ entry in bronchial contraction and remodeling. J Appl Physiol 2002;92:1594–602. Wang YX, Kotlikoff MI. Signalling pathway for histamine activation of nonselective cation channels in equine tracheal myocytes. J Physiol 2000;523:131–138. Snetkov VA, Hapgood KJ, McVicker CG, Lee TH, Ward JP. Mechanisms of leukotriene D4-induced constriction in human small bronchioles. Br J Pharmacol 2001;133:243–252. Janssen LJ, Wattie J, Lu-Chao H, Tazzeo T. Muscarinic excitation-contraction coupling mechanisms in tracheal and bronchial smooth muscles. J Appl Physiol 2001;91:1142–1151. Janssen LJ, Sims SM. Emptying and refilling of Ca2+ store in tracheal myocytes as indicated by ach-evoked currents and contraction. Am.J.Physiol 1993;265:C877–C886. Fleischmann BK, Wang YX, Kotlikoff MI. Muscarinic activation and calcium permeation of nonselective cation currents in airway myocytes. Am J Physiol 1997;272:C341–C349. Helli PB, Pertens E, Janssen LJ. Cyclopiazonic acid activates a Ca2+-permeable, nonselective cation conductance in porcine and bovine tracheal smooth muscle. J Appl Physiol 2005;99:1759–1768. Hirota S, Pertens E, Janssen LJ. The reverse mode of the Na+/Ca2+ exchanger provides a source of Ca2+ for store refilling following agonist-induced Ca2+ mobilization. 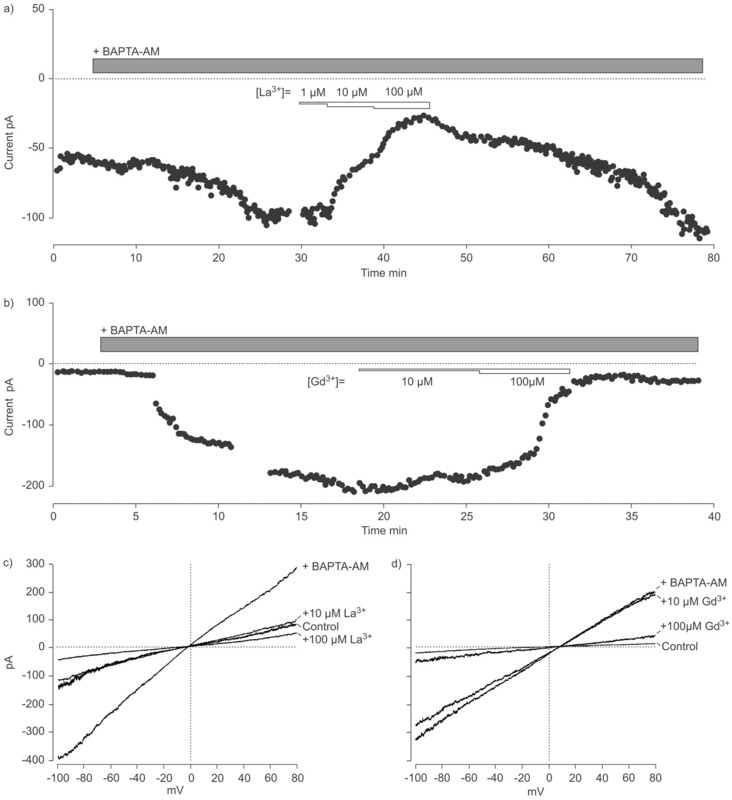 Am J Physiol Lung Cell Mol Physiol 2007;292:L438–L447. Dai JM, Kuo KH, Leo JM, van Breemen C, Lee CH. Mechanism of ACh-induced asynchronous calcium waves and tonic contraction in porcine tracheal muscle bundle. Am J Physiol Lung Cell Mol Physiol 2006;290:L459–L469. White TA, Xue A, Chini EN, Thompson M, Sieck GC, Wylam ME. Role of transient receptor potential C3 in TNF-α-enhanced calcium influx in human airway myocytes. Am J Respir Cell Mol Biol 2006;35:243–251. Freichel M, Vennekens R, Olausson J, et al. Functional role of TRPC proteins in native systems: implications from knockout and knock-down studies. J Physiol 2005;567:59–66. Albert AP, Pucovsky V, Prestwich SA, Large WA. TRPC3 properties of a native constitutively active Ca2+-permeable cation channel in rabbit ear artery myocytes. J Physiol 2006;571:361–369. Ethier MF, Yamaguchi H, Madison JM. Effects of cyclopiazonic acid on cytosolic calcium in bovine airway smooth muscle cells. Am J Physiol Lung Cell Mol Physiol 2001;281:L126–L133. Ito S, Kume H, Yamaki K, et al. Regulation of capacitative and noncapacitative receptor-operated Ca2+ entry by ρ-kinase in tracheal smooth muscle. Am J Respir Cell Mol Biol 2002;26:491–498. Ay B, Prakash YS, Pabelick CM, Sieck GC. Store-operated Ca2+ entry in porcine airway smooth muscle. Am J Physiol Lung Cell Mol Physiol 2004;286:L909–L917. Pabelick CM, Ay B, Prakash YS, Sieck GC. Effects of volatile anesthetics on store-operated Ca2+ influx in airway smooth muscle. Anesthesiology 2004;101:373–380. Yamashita T, Kokubun S. Nonselective cationic currents activated by acetylcholine in swine tracheal smooth muscle cells. Can J Physiol Pharmacol 1999;77:796–805. Tazzeo T, Zhang Y, Keshavjee S, Janssen LJ. Ryanodine receptors decant internal Ca2+ store in human and bovine airway smooth muscle. Eur Respir J 2008; 32:275–284. Bazan-Perkins B, Flores-Soto E, Barajas-Lopez C, Montano LM. Role of sarcoplasmic reticulum Ca2+ content in Ca2+ entry of bovine airway smooth muscle cells. Naunyn Schmiedebergs Arch Pharmacol 2003;368:277–283. Terasawa K, Nakajima T, Iida H, et al. 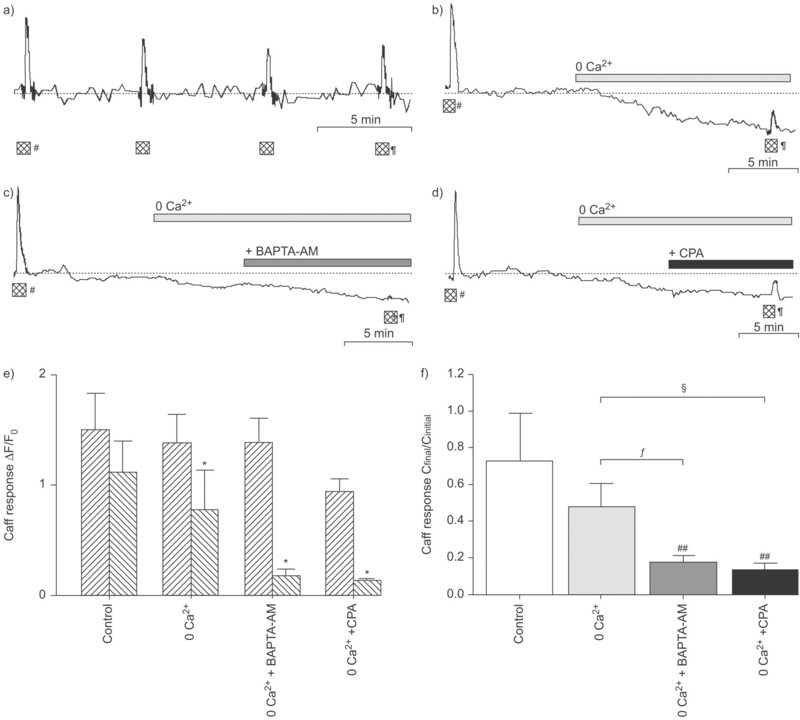 Nonselective cation currents regulate membrane potential of rabbit coronary arterial cell: modulation by lysophosphatidylcholine. Circulation 2002;106:3111–119. Wilson SM, Mason HS, Smith GD, et al. Comparative capacitative calcium entry mechanisms in canine pulmonary and renal arterial smooth muscle cells. J Physiol 2002;543:917–931. Ay B, Iyanoye A, Sieck GC, Prakash YS, Pabelick CM. Cyclic nucleotide regulation of store-operated Ca2+ influx in airway smooth muscle. Am J Physiol Lung Cell Mol.Physiol 2006;290:L278–L283. Albert AP, Large WA. A Ca2+-permeable non-selective cation channel activated by depletion of internal Ca2+ stores in single rabbit portal vein myocytes. J Physiol 2002;538:717–728. Albert AP, Piper AS, Large WA. Properties of a constitutively active Ca2+-permeable non-selective cation channel in rabbit ear artery myocytes. J Physiol 2003;549:143–156. Ng LC, Gurney AM. Store-operated channels mediate Ca2+ influx and contraction in rat pulmonary artery. Circ Res 2001;89:923–929. Albert AP, Large WA. Activation of store-operated channels by noradrenaline via protein kinase c in rabbit portal vein myocytes. J Physiol 2002;544:113–125. Halaszovich CR, Zitt C, Jungling E, Luckhoff A. Inhibition of TRP3 channels by lanthanides. block from the cytosolic side of the plasma membrane. J Biol Chem 2000;275:37423–37428. Trepakova ES, Gericke M, Hirakawa Y, Weisbrod RM, Cohen RA, Bolotina VM. Properties of a native cation channel activated by ca2+ store depletion in vascular smooth muscle cells. J Biol Chem 2001;276:7782–7790. Golovina VA, Platoshyn O, Bailey CL, et al. Upregulated TRP and enhanced capacitative Ca2+ entry in human pulmonary artery myocytes during proliferation. Am J Physiol Heart Circ Physiol 2001;280:H746–H755.